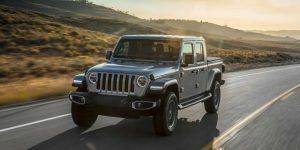 Gone are the days when we walked into a truck dealership to buy a basic truck with a basic V8 engine, a basic cloth laden interior, a basic truck bed and tailgate, and, you guessed it, a basic suspension system. “Basic” is so the 1990s. These days (aka the days of the half-ton truck that can easily crest $60k or more), it seems like the basic model now comes with a full safety technology suite, a more than adequate infotainment system that does everything, and wheels that don’t come in the steel variety. Not that this is a bad thing. It’s actually a great time to be a truck buyer because these vehicles are loaded with more technology, more interior features, more comfort, more powertrain options, and more optional packages than ever before. 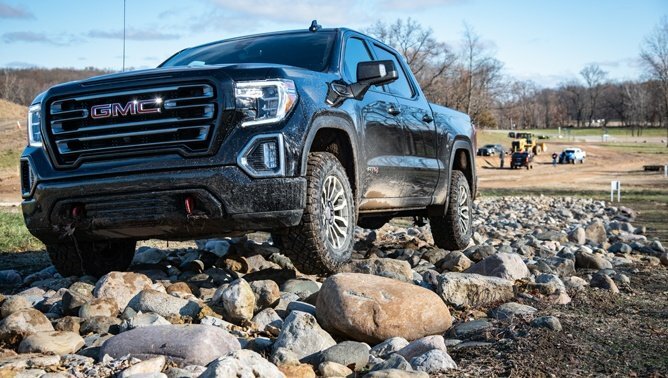 Case in point, the all-new 2019 GMC Sierra is the most refined pickup that GMC has ever put on dealership lots. It’s not basic at all, and the truck has more features and more amenities than ever before. 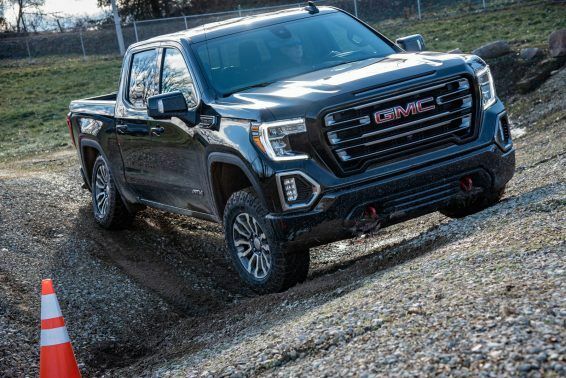 The AT4 is a perfect example of an all-new trim level that fits a market void that GMC has never gone after – the off-roader looking for a factory lifted truck with more features than your standard, run-of-the-mill skid plate package. 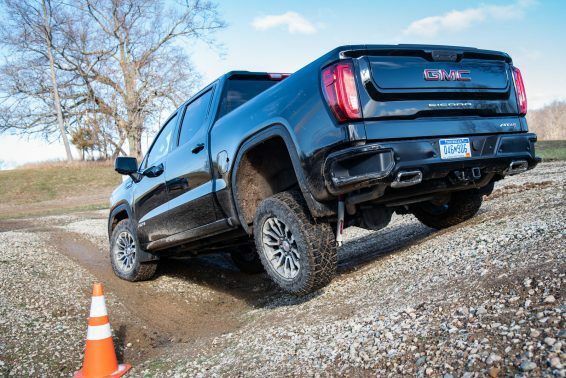 The AT4 does have the skid plates that you would find on an off-road version of the Sierra of yesteryear, but it is also equipped with off-road-ready features like a 2-inch factory lift kit, an Eaton G80 automatic locking rear differential, red tow hooks set into the color-matched front bumper, optional 6.2L V8 engine paired with the 10-speed automatic transmission, optional Goodyear Wrangler Duratrac tires for increased traction, industry-exclusive six-function MultiPro Tailgate, and a tasteful assortment of interior upgrades like the seats with their specific color ways. Like other new model GMC trucks, the AT4 is also available with an interior technology suite that sees optional features like a heads-up display, high definition surround vision cameras, rear camera mirror, and more. Fitting into the lineup as the second from the top model, the AT4 can be optioned out with every feature that would come in a Sierra Denali, but it won’t have the real wood trim, premium leather seats, and other items you’d expect in a Denali truck. The GMC designers kept the AT4 interior feeling like a more straightforward, off-road worthy setup. As you step inside of the truck, you’ll first notice the full coverage floor mats, which cover the entire floor so mud, snow, rocks, and other debris stays off of the carpet. Once sitting in the leather seats, we enjoyed the fact that the driver and passenger seats are fully adjustable in the AT4. In both on-road and off-road conditions, sight lines out the driver’s seat are definitely good with ample mirror coverage on each side and plenty of window space for checking blindspots. If a driver is ever not sure about a blind spot, the blind spot warning system is there to warn drivers if someone is in the next lane over. It wasn’t too intrusive on our drive. 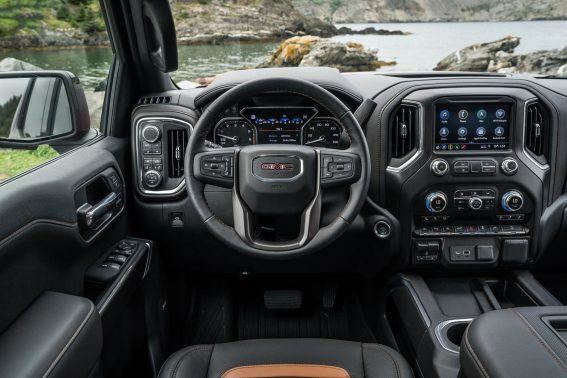 While the interior and infotainment setup may be a bit rudimentary when compared to the high glitz trucks on the market these days, the exterior is sharp and boldly says GMC from every angle. When you look towards the back of the truck, you’ll see that now famous six-position MultiPro tailgate. You might ask, “Why did we need to completely re-engineer the traditional tailgate?” Well, we needed to for good reason, and all of those reasons are summed up with the MultiPro unit. It’s more user-friendly than any tailgate from any truck manufacturer, mainly because it has those six different modes. Not only can it become the best tailgate step on the market, but it can also provide a higher workspace for people who work on the back of their tailgate. 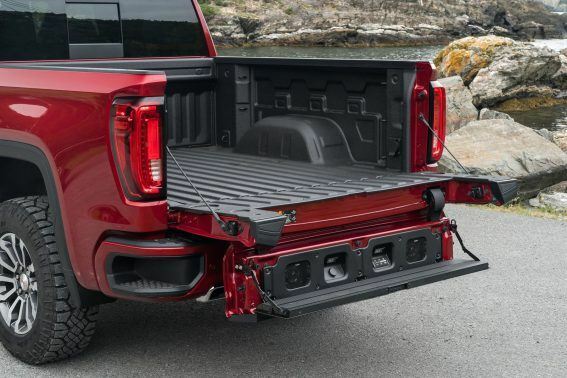 You can also have the tailgate in the lowered position and flip up just the top portion of it to act as a cargo hold when you have the back of the truck loaded down. 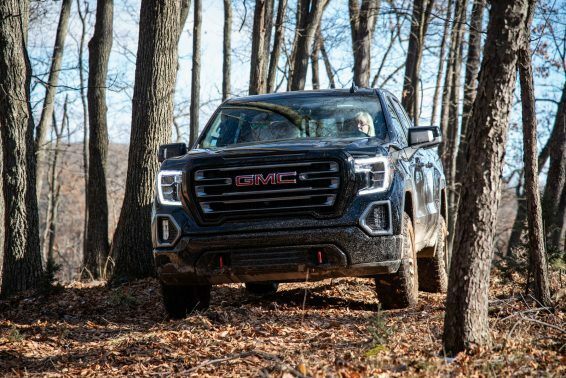 Similar to the other GMC truck models, which now number 6 total (Sierra, Sierra SLE, Sierra Elevation, Sierra SLT, Sierra AT4, and Sierra Denali, in order of upgrades), the AT4 can be had in either double cab or crew cab configurations. The base engine is the 5.3L V8 mated to the 6-speed auto. The 6.2L is optional and comes standard with the 10-speed auto. Coming next year, the Duramax 3.0L diesel will be an option on the AT4 and that engine will also come standard with the 10-speed automatic. From our experience, this 10-speed auto transmission is one of, if not the best, transmission on the market for all-around performance. It cruises and tows well and never hunts for gears, even with 10 of them on tap. Those of us looking for a bit of extra power from the two V8 engine options will want the optional Performance Package available that adds an exhaust and intake. On the 6.2L engine, the package adds 15 more horsepower and 9 more lb-ft of torque, bringing the totals to 435 hp and 469 lb-ft of torque. We also found that the transmission and transfer case gearing in 4Low was adequately low for the terrain we were testing on. 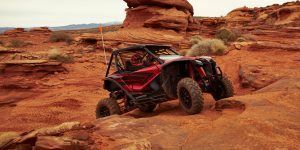 At Eaton’s extensive proving grounds, the AT4 was able to crawl up the rock climbs without any hesitation at 1-2 mph on the 30% grades. The Z71-sourced skid plate package provided adequate protection for the mid-sized (1-2 foot at the largest point) boulders we were going over, too. With only a 2-inch lift on this truck, it did occasionally bottom out on this terrain, but it isn’t meant for heavy duty rock climbing, so this is to be expected. Same goes for the sand and loose, loamy dirt portion of the test area. This section allowed the truck to sink about a foot into the dirt to test overall traction and tire side bite. 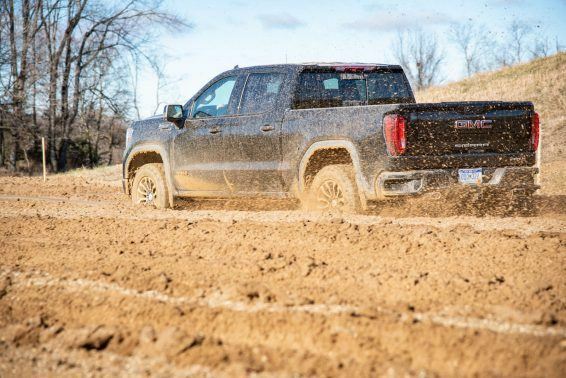 With 4Low engaged and the truck in the manual shifting mode (gear changes are completed by the driver via the up/down switch on the gear shifter), the truck stayed the course and powered its way through the muck. The throttle response is smooth and steady, allowing the driver to precisely control how much power gets pushed to the wheels. This is where the manual mode comes in really handy and is a must-have – leaving the truck in automatic allows it to shift up and down searching for gears, not ideal in this sandy, loose situation. The optional Duratrac tires were able to get enough traction to clear this area with ease. 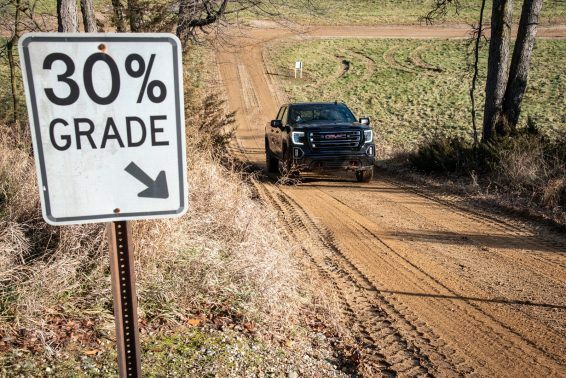 While we wouldn’t say these are the best meats we have tested in this terrain, they do work well enough to save you from ditching the stock tires immediately if you were to buy this truck. 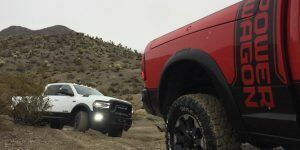 They would be good enough to wear out and if you’re really serious about your soft roading expeditions, then some beefier all terrains should be on your list for future purchases. ALSO SEE: Ford Ranger vs F-150: Which Truck is Right for You? This loamy section also allowed us to test out the Rancho shocks at higher speeds. While not the most bump absorbent setup on a purpose-built off-road truck, the Ranchos do an admirable job. They are predictable and keep all the wheels firmly planted on the ground, which in turn increases confidence in the driver. 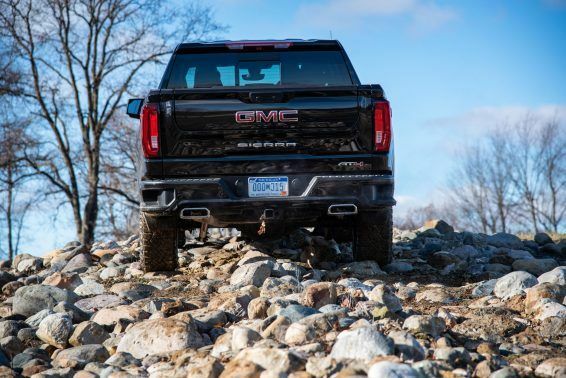 Overall, GMC nailed this setup by making this truck have just enough off-road suspension capability without making it a bear to live with as a daily driver. Another part of the test track allowed us to find out what the revised hill start assist system had to offer. Instead of just holding the truck for a couple of seconds like the last iteration, the new system will hold the truck indefinitely on steep grades (in our case a 30% grade). Once you apply throttle, the brakes ease off so your acceleration is smooth and effortless. If I’m being completely honest, I always thought these systems were overrated because a driver could make smoother stop-start, 2-foot driving transitions uphill compared to the electronics on other vehicles. Well, I finally met my match and found a system that is consistently smoother than a human’s touch. No exaggeration, it really is that good. And, the best part is that the system engages without any fumbling through the menus – just have the truck in 4Low up an incline and it does the rest. A couple of interior features that came in really handy on our street and off-road drives were the Heads Up Display (HUD) and surround view camera system. Both of these features are included in the technology package. The HUD system, which projects the information low and out of your direct sight lines on the lower part of the front windshield, allows you to scroll through menus to change the display on the truck. On the off-road section, the HUD is more fun than useful at it displays the inclination and roll angles. The other feature that was handier off-road than on-road was the surround view camera system. For anyone planning on doing some serious trail running with this truck, this system is a must have because it has cameras on the front, sides, and rear of the truck, creating a virtual surround of the vehicle. We tested it on the 30% inclination and found the front camera to be extremely helpful with getting a birds-eye view of what was over the hood when we couldn’t see what was directly in front of us at the top. The hood on the GMC isn’t especially long and actually has good sight lines out of it, but no truck can have ultimate angles out of the front because of long hoods. The front camera takes care of these problems. 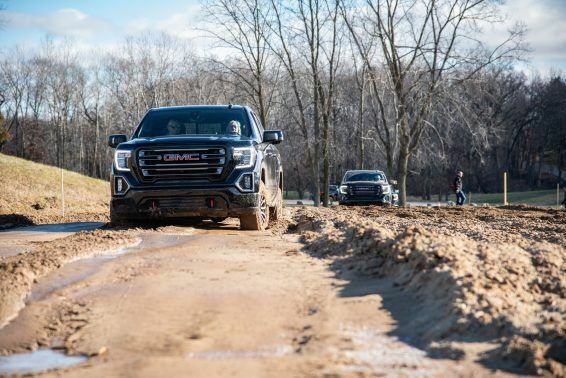 For the off-road enthusiast in all of us, the factory lifted GMC Sierra AT4 and its choice of V8 engines offer very good fuel economy and easy to work on powertrain systems. Circling back around to our original thought here, this fully optioned out Sierra AT4 truck stickers for just over $65k. While not out of the norm for today’s trucks, I can’t imagine paying this much money for a half-ton truck with a 2-inch suspension lift, several well thought out accessories, and a big V8 engine. Call me old school, but that just seems like it’s way overpriced to me. But, then again, people are dropping $75k on trucks all the time, so I suppose I am just a bit out of touch. Base AT4s with the 5.3L and fewer creature comforts can retail for as low as $50,800, which is more manageable. Price and my personal frivolous nature aside, buyer’s of the Sierra AT4 will be impressed by its on-road and off-road manners. It has just enough capability off-road to call it a truly capable truck right from the factory, and it is smooth enough for grandma and grandpa to drive to and from their favorite date night hangout downtown. 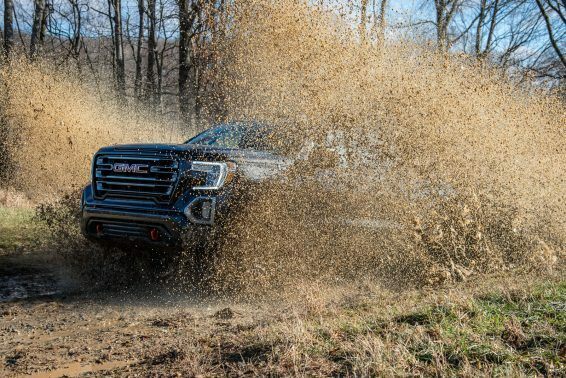 If you look past the few shortcomings, you’ll see that the 2019 GMC Sierra AT4 is a true winner of a truck.